Handover ceremonies of the twenty-room, three hundred square meter Gala Batur Basic Health Center took place on September 15th outside the village of Taloqan in Takhar Province, North Afghanistan. The $230,000 (USD) purpose-built Health Center was constructed over the past 16 months as part of the KfW funded ‘Rehabilitation of Hospitals in Northern Afghanistan’ project and replaces a former worn-out health structure. 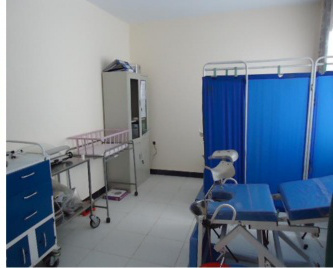 Comprised of general consultation, treatment and security rooms as well as a separate mother and child unit with overnight observation rooms, the center is expected to provide preventive and curative care to more than 200 daily visitors stemming from the 24 neighboring villages. Medical equipment at a value of $12,000 (USD) was provided to complement existing equipment and replace obsolete or broken equipment. Due to the challenging water and electricity supply in the remote region, the Gala Batur Basic Health Center was constructed with sustainable ‘green’ technology. Boreholes were drilled for water provision and a wind powered water supply system was developed by the German NGO ‘German Medical Service’ (GMS). Water storage tanks were also developed as a back up to the wind powered water pump. A solar powered system was created for light and medical equipment needs. Land surface protection measures, including flood and erosion protection measures, were also part of the project. Sandwich wall insulation, double-glazed widows and tree plantings were incorporated to assist in temperature management of the building.